Sire:Aust. Ch. Fernfall Let Me Entertain You "Will"
Dam:Aust. Ch. 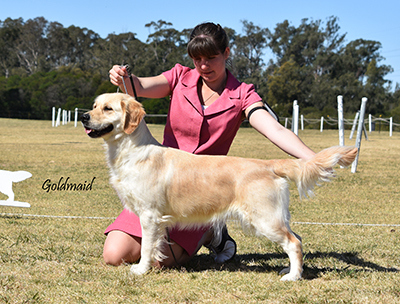 Dykinta Chance at Fame "Fame"
Tuppence – by the time she left Puppy Class she was already half way to becoming an Australian Champion!! Tuppence & her litter mates had a “Pirate” theme to their naming. “Nine Pieces O Eight” is a term taken from the movie “Pirates of the Caribbean – At Worlds End”. A Piece of Eight is a Silver Spanish coin. In the movie the Pirate Lords needed 9 of these Silver coins to release Calypso from her human bonds. 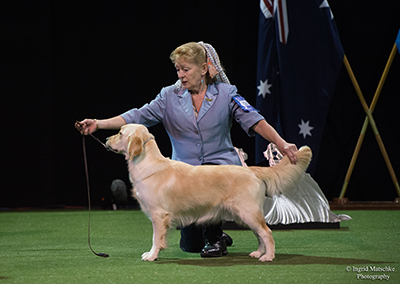 BlueBreeze Kennels is a well known breeder of Champion Golden Retriever Pedigree Dogs. Enquire about our "goldens" availability for stud and the availability of golden retriever puppies for sale.